It won't have escaped your notice that the BBC's OfficialChart Show has shifted from its traditional Sunday slot to Friday afternoon. 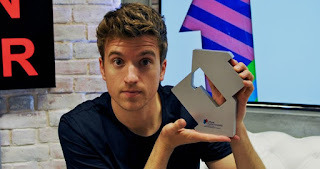 Whilst it's easy to get all misty-eyed about listening to (and in all probability recording) the Top 40 on a Sunday, most of those doing so are unlikely to still be listening to Radio 1 and would struggle to name the current number one. Greg James delivered an exemplary performance on Friday's new chart. Minimum chat and maximum music. With a running time almost half that of the old Sunday show there's only time to play the Top 25 but at least it cut back on the extraneous stuff that had crept into the show in recent years. Note how Greg welcomes in the "new era" with the full date, ideal for archive clipping, and refers to "the exciting new sound", a lovely touch I thought. This is "proper radio history." That mention of "the exciting new sound" was probably on Greg's mind after speaking to Tony Blackburn earlier in the day on BBC Radio Berkshire. The chart show had been a Sunday afternoon fixture since 7 January 1962 when Alan Freeman's Pick of the Pops moved from Saturday nights. Two DJs stand out as imbuing the programme with energy and excitement: Bruno Brookes and Mark Goodier. Both have made appearances on BBC local radio in the last few days. And the current number one: David Zowie's House Every Weekend. Other chart shows are available ... on a Sunday!